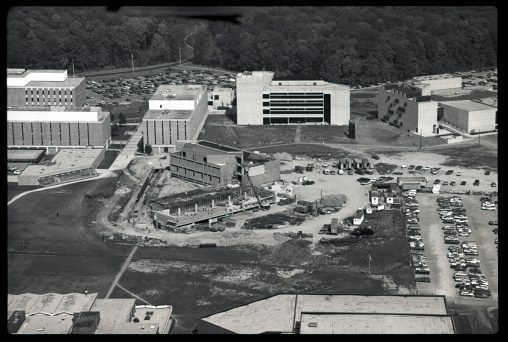 The 1970s were a decade of firsts for Wright State University: the first residence hall, basketball game, women’s sports teams and first students admitted into the Boonshoft School of Medicine and the School of Professional Psychology. During the decade, Wright State also put itself on the map with distinctive programs, campus development and university research. Hamilton Hall, the university’s first residence hall, opened in 1970. In its first year, it was the home of 242 residential students. Today, Hamilton Hall houses more than 300 students. With enrollment growing to 11,000 in 1970, it was time to develop sports. Wright State’s first men’s basketball game took place in 1970 against Cumberland. Before Wright State athletes were even known as the Raiders, Wright State had a strong athletics program. In 1971, the athletes officially became the Raiders. In 1972, the first women’s sports teams, tennis and softball, were established. Wright State won the third annual intercollegiate wheelchair basketball tournament in 1979. The Lake Campus grew during the decade, and in 1979, the campus broke ground on facilities to house two-year technical programs. The Bolinga Black Cultural Resources Center opened in 1971. This center for promoting the understanding of culture and heritage of black Americans was dedicated on Martin Luther King Jr.’s birthday by C.J. McLin, who served in the Ohio House of Representatives from 1967 to 1988. The vision of the Bolinga Black Cultural Resources Center is to be a premier organization that contributes to the success of every individual in gaining a deeper awareness and appreciation African American history and culture by providing excellent programs, services and experiences. Also in 1971, the Wright State Alumni Association was established to foster a fellowship of individuals who share a common institutional interest and to develop a sound collegiate heritage by coordinating activities and services that contribute to the academic, cultural and physical growth of Wright State. The Alumni Association has expanded through large national network, with locations in Tampa, Columbus, New York City and Washington, D.C.
1973 brought three new buildings: the Creative Arts Center, Brehm Lab and the university library, later renamed the Paul Laurence Dunbar Library. Wright State’s second president, Robert J. Kegerreis, was appointed that same year. Additionally, Wright State started first the first baccalaureate nursing program in the Dayton area, followed by a graduate nursing program in 1978. Wright State students organized a drive to raise funds and food for victims of the the 1974 Xenia tornado, raising over $3,000 and donating more than 70 trucks full of goods. The alumni teaching excellence awards were first distributed in 1975 by the Alumni Association as a part of the first alumni fund drive. The association solicited nominations from students and alumni of their favorite teachers and handed the awards out annually. The ’70s also saw students admitted into several new schools and established Wright State as a strong research institution. The School of Medicine admitted its first students in 1976. It was renamed the Boonshoft School of Medicine in 2005 in recognition of the Oscar Boonshoft family, who donated $28.5 million to the school. The school’s goal is to progress as a preeminent community-based medical school that advances new models of academic excellence and community health care. Students were admitted to the School of Professional Psychology in 1979, where they are educated for excellence and innovation in the practice of psychology. The school aspires to ensure training that is oriented to both personal and professional development within a challenging and respectful environment that values diversity among faculty, staff, students, clients and community. The energy crisis of the 1970s brought change for Wright State. While universities continued regular operation, Wright State lowered thermostats, turned off hot water taps and dimmed lights across the campus. Andrews Hall continues to house the national award-winning Office Information Systems programs. Trenary Laboratory was also added at that time, and currently houses the Mechanical Engineering facilities. These buildings were named for the Andrews and Trenary families in recognition of their generous support. 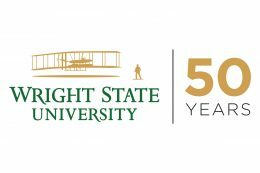 Wright State became an independent institution in 1967 and has grown into an innovative leader in the Dayton region and beyond, capturing the spirit of the university’s namesakes, Wilbur and Orville Wright, who invented the world’s first successful airplane from their Dayton bicycle shop. It celebrates its 50th anniversary as an independent public university in 2017, culminating with a special Homecoming celebration Sept. 29 through Oct. 1. The library and Creative Arts Center under construction. President Robert Kegerreis addressing a group of students. Production of “Taming of the Shrew” at Wright State. Wright State medical students working together. WWSU, the student radio station, in May 1972. The men’s first basketball game, against Cumberland, on Nov. 20, 1970. Women’s softball team in 1973. Performers during Wright State’s May Days celebration. Social Work student in 1974. First wheelchair basketball team during a game in February 1974. Students and staff at the Bolinga Black Cultural Resources Center. New extensions to tunnel network in 1977.